I thought it was about time I introduced you to my feathered flock. 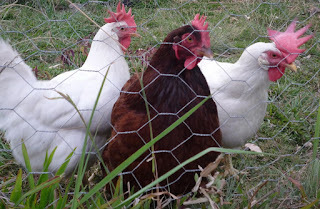 The "girls" and their cages were given to us as wedding presents three years ago. 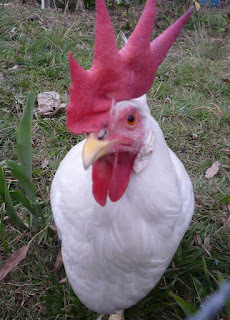 Since then they've been providing us with dorky entertainment, fresh eggs far bigger and brighter than any you can buy at the shops and quick vegie scrap recycling services. 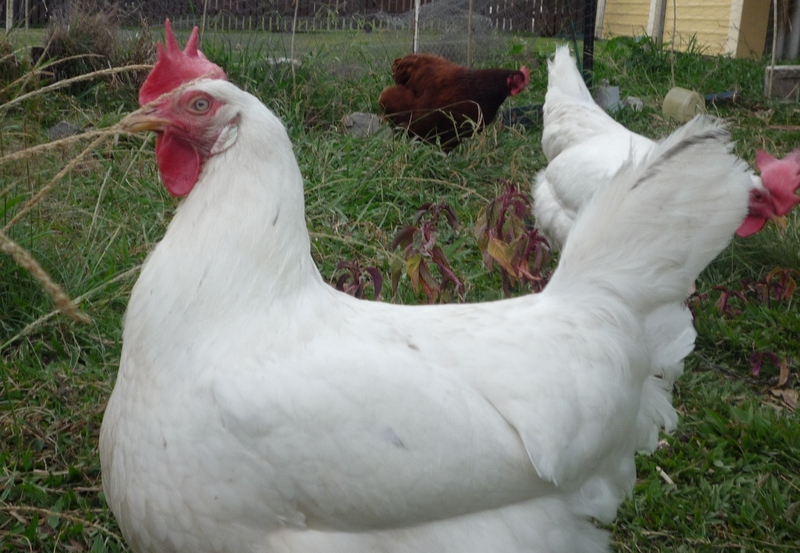 Despite becoming what many producers would call too old for productive hens, they are still giving us more than enough eggs despite their age. We let them out in their pen every day so they get plenty of room to scratch around, have a dustbath and look for bugs. They're spoilt for choice when it comes to scraps too - they get our's, the neighbours' and a weekly "Bok Box" from my work. Here are the three big chooks aka the big bears who came from a family who could no longer look after them. Introducing Wheelie. When the chooks first arrived she seemed to be the third wheel of the group. Now she's the little rascal who gets out on occasion to dig up my seeds. I'm not sure you can tell in this photo but there is something wrong with one of her eyes. She seems to be able to see movement and at least shadows out of it but the pupil can't constrict or dilate properly. It doesn't seem to interfere too much with her eating but it definitely takes her a long time to make it down from the perch - pacing up and down trying to line up the door. Yet, somehow she can fly through a smaller gap in the top of the fence to get out. She has been attacked by a dog on two separate occasions and by some miracle come out of both relatively unscathed so perhaps her eye problem is the result of one of these. 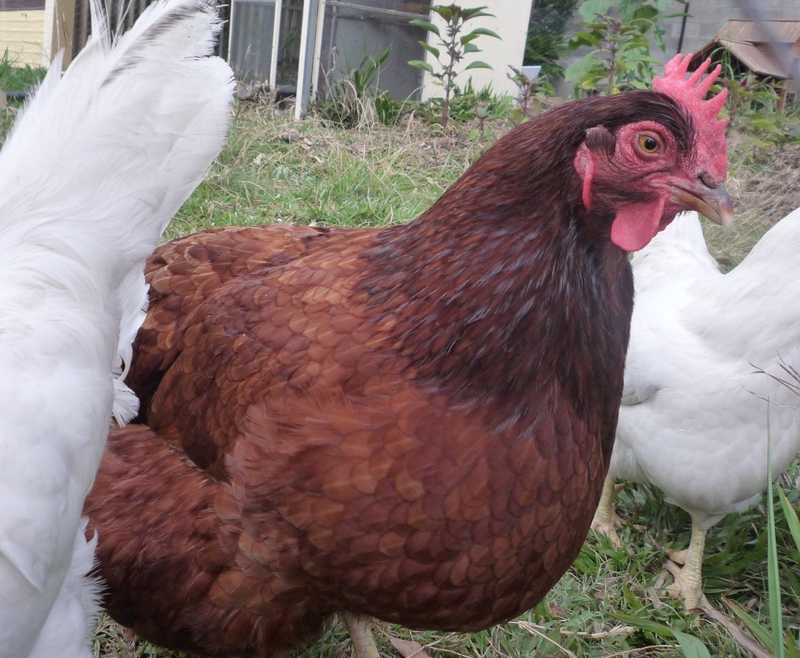 This is Hetty Hen, a dumpy Rhode Island Red with impressive drumsticks and an appetite to match as you can tell by the size of her crop in this photo. Her eggs weigh a good 80g or more and don't fit in the standard sized cartons. She also has a good eye for any bugs I might throw over the fence. Gonzo is the larger of the two white chooks (a Leghorn I think) and is the head honcho. She gets first dibs on food in the morning and dustbaths in the afternoon. Her comb flops from side to side as she runs toward you. 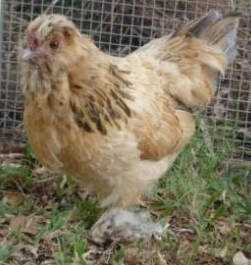 I've introduced her before but this is Goldilocks (aka the Cluck Monster). She's a bantam so the three big bears above pick on her a bit, stealing her dustbath and food but never hurting her badly. I feed her first in the morning before I let the others out to make sure she gets enough to eat and some time to free range unhindered. She came from an animal shelter so I have no idea how old she is or what breed (perhaps Belgian d'Uccle x something). She's very sweet and with her fluffy feet she looks like she's wearing pyjamas all the time. Her eggs are a cute 45g which is tiny compared to the other chooks but scarily nearly the size of "large" eggs from the supermarket. I'd love her to be a mummy one day as she goes clucky regularly but looks after herself when she is, popping out for food and water at regular intervals before returning to the nest.